I was one of those horse girls. One of those thousands of little girls who dreamed of horses all the time. I saved my allowance to buy plastic models of my favorite breeds, then spent hours playing with the models, hand-sewing saddle blankets for them, and collecting lawn clippings to dry and make into “hay”. I somehow missed out on a lot of the standard children and teen literature, but name a horse book and I probably read it. In sixth grade, I checked out Walter Farley’s Man O’ War from the library every two weeks. Really. I checked it out, read it, returned it, and then renewed it right on the spot. I reread and re-cried over the ending of Marguerite Henry’s The King of the Wind more times than I want to admit here in public. I belonged to “The Horse Book of The Month Club”. When I finally badgered my parents enough to let me take riding lessons, I was at the barn every possible moment, taking lessons, mucking stalls (for free! ), and, later, leading trail rides and teaching beginner classes. I wanted to live and breathe horses all day long. I got high on horse smell. And the creak of saddle leather. Which partly explains why we have goats. When, in my last year of high school, I finally got the chance to have a horse all to myself, I met my first goat. His name was Petey and he belonged to the barn, company for an older horse there. Petey charmed me. He was sweet, intelligent, and always good for a laugh. He was inquisitive. And cuddly, too. I always imagined I’d have horses when I grew up, but as it turned, horses (at least so far) never really made sense for me, requiring space, money, and time that I never seemed to have all at once. But goats seemed doable, and when I developed a love of goat cheese, and then developed a love for a man who also saw the merits of goats and cheese, well, things just naturally evolved. 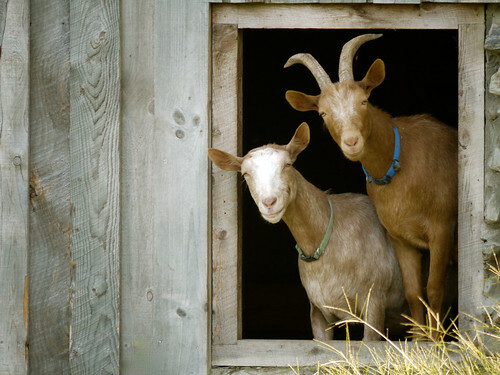 Now, we have these darling goats, who bleat gently at us every time we step out onto the back porch that faces the barn. They crowd around me when I’m feeding hay, nibbling at my jacket, looking for cookies. Westie always meets me first, trying to get a good head rub from me before the others push her out of the way. Wellesley rubs her head against my legs, as if she’s a big cat, owning me. Willow nibbles my nose and gives me goat kisses. The boys, Albus and Lars, jockey for position near the hay bag I’m carrying, trying to sneak mouthfuls of hay as I make my way to the feeder. As I do chores around the barn, they follow me. If I have a tool (a screwdriver, a shovel), they must sniff and inspect it. Wherever I am, they must be, too. On winter mornings, I’m loathe to leave the warmth of the house. My boots are out there on the porch, cold. I put on my coat. Sometimes my hat. Certainly my gloves. I step out into the frigid air and mutter grumpily to myself. Then I look up, and toward the barn. There they are, looking out their window, watching me, waiting for me. I smile, step off the porch, call their names, start my day. I was one of those horse girls also. My sister and I would find any way possible to ride horses. My childhood dream was to live on a farm and have my own horse. This all didn’t happen until I was in my 40’s. Mom passed away. Dad moved to NE Tennessee to, you guessed it, a farm. When I moved up from Fl to be near him, my daughter and grandson he gave me my very first horse. I had him for 21 years. Dad also had goats. Something about them goats. When dad passed away 6 years ago I inherited his favorite old milk goat. Brownie was a Nubian and passed away a few years later at 20 years old. 4 years ago I decided to raise goats for fun and profit. I’m still waiting on the profit part. But I am having a lot of fun with my babies. I’m still wanting to try to make cheese but I’m torn between drinking the milk and making cheese. What a great post, Rebecca. I’ve heard you mention the various goats on numerous occasions, but it’s nice to read the whole backstory all in one place.